This workshop is organized in the framework of OBELICS (Observatory E-environments LINked by common ChallengeS) work package of ASTERICS. OBELICS activities aim at encouraging common developments and adoption of common solutions for data processing, archive, analysis and access among ESFRI and world class projects in Astronomy and Astroparticle Physics, such as CTA, SKA, KM3NeT, EUCLID, LSST, EGO-Virgo, E-ELT. 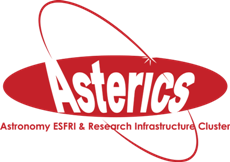 The ASTERICS – OBELICS workshops aim at building bridges between ESFRI projects, concerned scientific communities, e-infrastructures, industries and further consortia. The Second ASTERICS – OBELICS Workshop will address potential connections between the ESFRI projects and the implementation of EOSC for data interoperability.